SEOUL, South Korea (AP) — South Korea’s Supreme Court said a former worker in a Samsung LCD factory who was diagnosed with multiple sclerosis should be recognized as having an occupationally caused disease, overturning lower court verdicts that held a lack of evidence against the worker. In a milestone decision that could aid other sickened tech workers struggling to prove the origin of their diseases, the Supreme Court ruled there was a significant link between Lee Hee-jin’s disease and workplace hazards and her working conditions. In its ruling Tuesday, the court said the lack of evidence, resulting from Samsung’s refusal to provide the information and an inadequate investigation by the government, should not be held against the sickened worker. Lee first filed a claim in 2010 with a government agency, which denied her request for compensation. She took her case to the courts and lost twice before Tuesday’s victory. “It was a long journey but I’m so happy,” Lee said by text message. She is the third Samsung worker to report multiple sclerosis and win in court but the first to win in the Supreme Court, according to SHARPS, a group that advocates technology workers’ health. The Supreme Court said the high level of physical and mental stress in her job, long working hours, everyday use of a chemical, possible exposure to other chemical substances used on nearby assembly lines, and a lack of a family history of the disease were enough to rule in the worker’s favor. The ruling is a blow to Samsung Electronics and to two government agencies, the Korea Workers’ Compensation and Welfare Service and the Korea Occupational Safety and Health Agency. The agencies levy regular fees on employers and determine compensation when workers file claims of occupational diseases. The Korea Workers’ Compensation and Welfare Service was the defendant in the case. A panel of four Supreme Court justices faulted the government agencies for failing to measure workers’ exposure levels during their early investigation. The ruling also noted that Samsung Electronics and the Labor Ministry refused to disclose information about chemical toxins at the LCD factory, making it impossible for the worker to prove the type of chemicals she was exposed to or the level of exposure. Lee’s case was reported by The Associated Press in 2016 as one of several in which the government and Samsung denied workers key safety data needed to win state compensation. Samsung declined to comment Wednesday on the Supreme Court ruling. In its decision, the highest court recognized for the first time the difficulties of proving occupational diseases for workers in the fast-changing technology industry. In the semiconductor and display industries, which have a shorter history than more traditional industries, few studies on occupational disease are available. The types of chemicals used in manufacturing change frequently and the names of chemical substances are often considered trade secrets. The court urged the government agency to be true to its mission to protect workers suffering from grave diseases and lack of income, not to find fault either with the worker or employer. It said the agency’s role as a provider of social insurance is even more important in the cutting-edge tech industry, which has unknown risks that may involve worker sacrifices. Activists led by SHARPS have campaigned for years to reform the compensation system, saying it is unfair that workers are the ones with the onus of proving their case. The difficulty of obtaining state compensation has left many workers with few options. In 2015, Samsung offered financial aid that covered medical fees and some income for workers with any of 26 diseases including cancer and multiple sclerosis. 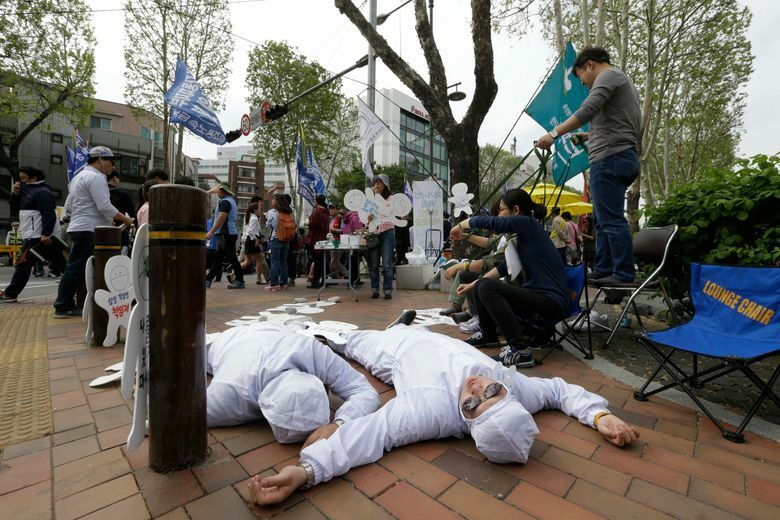 Some workers or their families rejected what they called a unilateral, secretive deal and demanded that Samsung apologize sincerely for the sicknesses and provide transparent compensation.